Welcome to the sixth annual Voices of Wrestling Match of the Year Poll! The brainchild of VOW co-owner Rich Kraetsch, it all started in 2012 with a modest four person panel of myself (Joe Lanza), Rich, VOW’s then-PWG reviewer “Larry”, and Billy Carpenter of 4 Corners Radio. We each selected our ten best matches of the year, wrote short blurbs on why each match was selected, and combined the lists to come up with a collaborative top ten. For 2013, I approached Rich about expanding upon his original idea by extending invites to dozens of other wrestling critics. Each year in the world of film, there are media/critic polls ranking the top films of the year. There was nothing like those critic polls that we see in film that had ever existed for wrestling matches. With that template in mind, we sent ballots to dozens of journalists, bloggers, radio hosts, podcasters, historians, reporters, and critics who we knew loved wrestling, had a reputation for having a solid base of knowledge and strong opinions, and had quality endeavors that we could help expose to our readers in exchange for participating. We knew not everybody would respond, but we were quite pleased with who did, and we feel like the results did bear out the variety of matches and wrestling styles that we were seeking. 25 total voters responded by voting for over 90 matches from 23 different promotions. The growth continued with the 2014 poll, with 67 voters voting for 156 different matches, from 35 different promotions. The 2015 poll featured 97 voters voting for 199 different matches from 42 different promotions. We once again shattered all previous records for the fourth consecutive year in 2016. An utterly ridiculous 117 voters checked in and accounted for the widest variety yet, with 239 matches emanating from 49 different worldwide promotions. The 2017 poll saw the diversity grow again, with 54(!) different promotions represented. 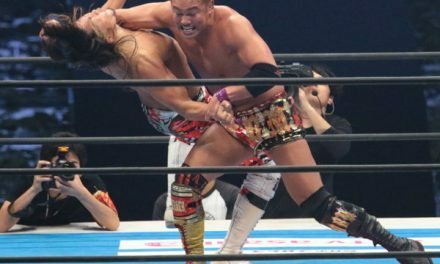 Each voter was sent a ballot and asked to vote for ten best matches of the year, ranking them from 1-10. We use the same weighted balloting system used by Major League Baseball for their Most Valuable Player voting, with a first place vote worth 14 points, and a descending 9-8-7… scale from there, a system which places heavy emphasis on each voter’s choice for best overall match of the year. For example, if two matches are tied in total points, with one match appearing on more total ballots, it will not require the second step tie breaker. The match appearing on more total ballots would place higher. If two matches are tied in total points, and remain tied by appearing on the same number of ballots, the match with the highest singular vote wins the tiebreaker. Our panel was free to vote for any worked match in the world that took place between January 1, 2017 – December 31, 2017. Our long term goal is to become the most comprehensive and respected MOTY poll in all of wrestling, while continuing to cross promote the great ventures of our voter pool and exposing fans to matches that they otherwise never would have discovered. Enough talk. 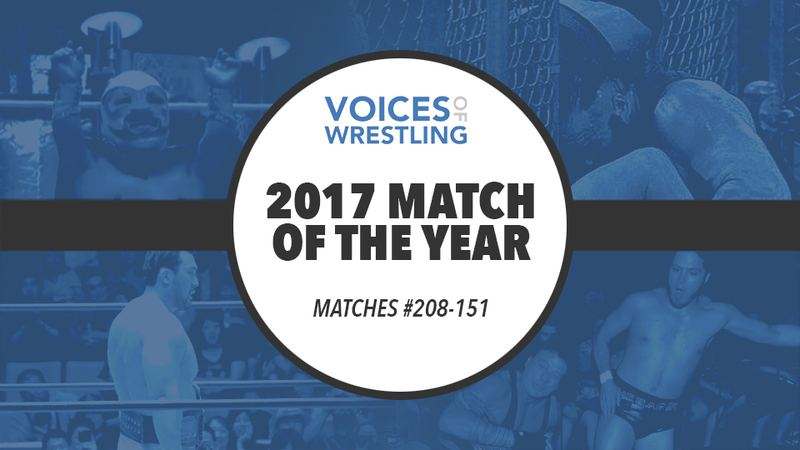 Here are the 233 best matches of 2017! We’ll begin today with a look at the honorable mentions (dubbed “Sadness Village” by current staff member John Carroll ), with a new chunk of matches released each day until we reveal the Top 10 on Friday, February 2 (with a sneak preview of the Top 10 to be released to our Patreon subscribers). “Not sure if anyone thought that a 57 Blue Panther and Sam Adonis would put on a barn burner, but this one a really fun romp. They worked to Panther’s strengths and the energy from the crowd was palpable throughout, which is a testament to Adonis’s heel work in CMLL. He has taken the Prodigal son of Trump schtick to a new level that captures the heel aesthetic from the 70’s and 80’s perfectly. There weren’t any highlight reel moments here, but the story told was incredible and Adonis winning drew real heat from the crowd. This is a blueprint for a heel taking on an entire arena and still going over to spite them.” -Rich Laconi on Sam Adonis vs. Blue Panther Jr.